People have been dancing as long as we can remember. Medieval children ringing round the roses of the Black Plague, Renaissance nobility processing to the stately basse danse, city folk courting to the steps of the pavane, and the already pregnant bride in Brueghel�s painting The Peasant Wedding, all danced their way through the rituals of life; courtship, marriage, political intrigue, harvest, and the final Dance of Death which we must all join regardless of social status, wealth or position. Just as their choreography balances delicately between the strict restraints of convention and the ingenious flourishes of spontaneous florid motion, its music weds strict and unchanging patterns with kaleidoscopic permutations of musical invention. 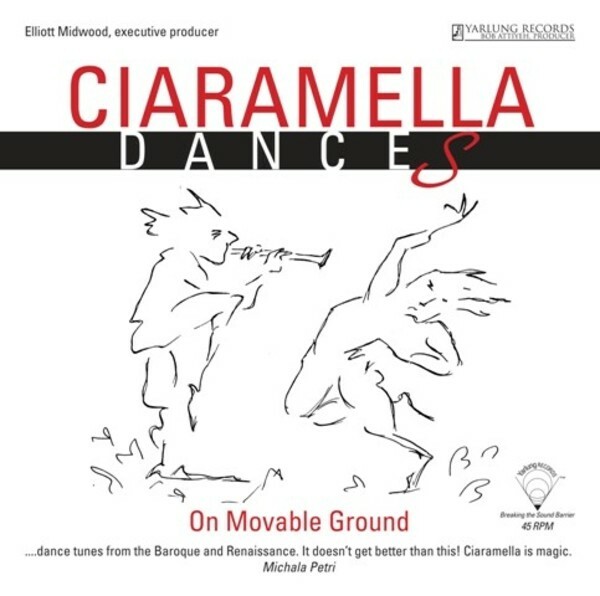 Our title �Ciaramella: Dances on Moveable Ground� plays on the fact that we live in Southern California, where the ground might roll or shake below our feet at any time. But dancing on shifting grounds is also a musical concept that serves as a unifying element in this recording. Grounds are the repeated chord progressions and melodies that lie at the heart of Renaissance and Baroque dance. Some, like the passacaglia, contain ostinato patterns which repeat only four descending notes and their harmonies. Others, like the passamezzo antico, modern and romanesca, consist of four-chord progressions with open (unresolved) and closed (resolved) endings, a musical question and answer. These grounds form the basis of almost all dances of the early modern era.